On this day, fifteen years ago in Japan, the Nintendo GameCube made its debut in the world. The sleek cube design, the four controller ports, and that lovely handle to carry the system to your friend's house-- glorious! With said four controller ports, Nintendo and third parties unleashed numerous games that kept sleepovers and parties rocking on into the night. These ten games with multiplayer components remain favorites of SuperPhillip Central, and hopefully they're favorites of yours as well! The first on this game comes from Nintendo's innovative idea to have Game Boy Advances connected to the system for a dual screened style of gameplay that was a little too far ahead of its time. 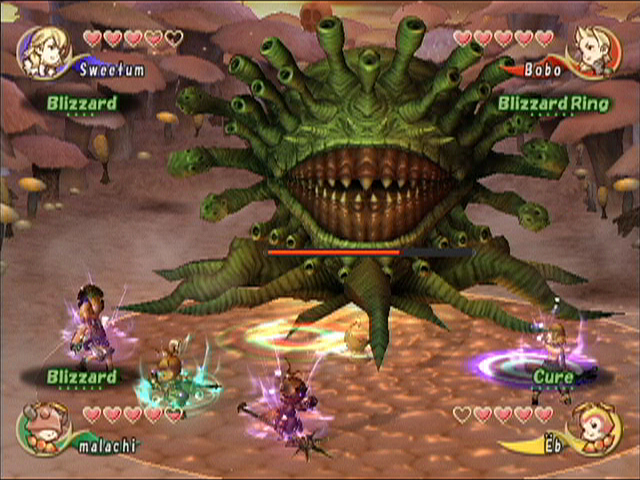 However, Square's first game on a Nintendo home console since Super Mario RPG on the Super Nintendo, Final Fantasy Crystal Chronicles, brought up to four players the ability to scour and crawl through monster-infested dungeons, solve simple environmental puzzles, and slay gigantic bosses together. Cooperation was the name of the game, requiring one player to carry the protective field of the crystal chalice to save their companions from the poisonous fog that would otherwise throw a wrench in the fun. 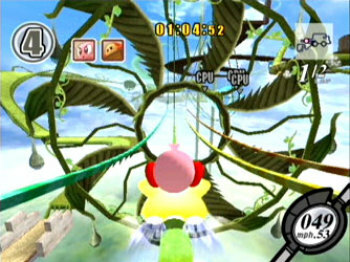 At the time of its release, critics weren't too kind to Kirby's jump into the racing genre. However, as the years have gone by, gamers have opened up to Kirby Air Ride and have developed a bit of a fondness for the game. Its easy-to-learn one button means to brake and turn corners made it so there was a feeling of simplicity with the controls, but when you got down to mastering them, there was a quite a lot of complexity. 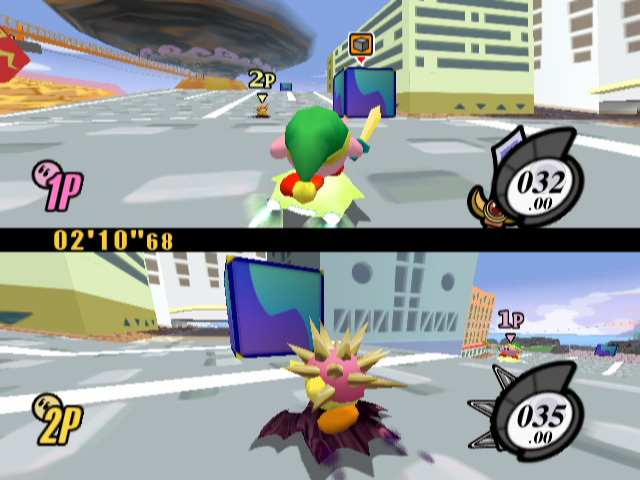 With three different racing modes: the traditional third-person racing, the top-down miniature tracks, and the open City Trial fun for up to four players to boost their rides with power-ups for a random round of racing, a skill-based affair like a jumping distance challenge, or a free-for-all battle, Kirby Air Ride is still to this day a game that gets some play in local multiplayer retro nights with the old 'Cube. Most North Americans, specifically those in the States, don't fully appreciate the sport of football, well-- or as we know it, soccer. However, when you add one of the most famous characters of all time in Mario to the fold, then for most people their interest increases. 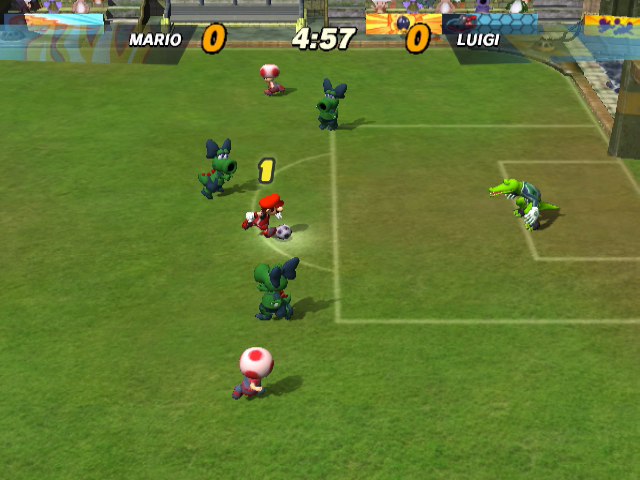 Super Mario Strikers took the fun of footy and made it accessible and most importantly fun for all ages and skill ranges. 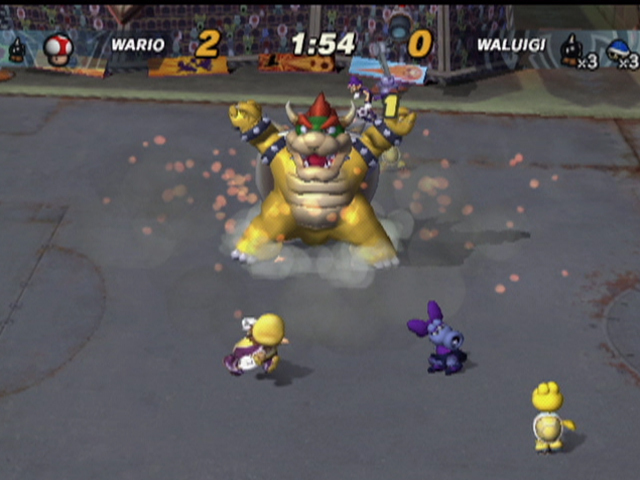 Sporting a more attitude-filled sports package than other Mario sports series, Super Mario Strikers featured the use of items, the ability to slam opponents into an electrified fence that ran around the perimeter of the pitch, and fast-paced gameplay to keep every match as exciting as possible. What was a sport that might not appeal to most Americans becomes a heck of a good time with Super Mario Strikers. Memories of GoldenEye and its spiritual successor Perfect Dark go dancing in players' heads when they boot up the TimeSplitters series from Free Radical, a developer that was devised of former Rare staff members. 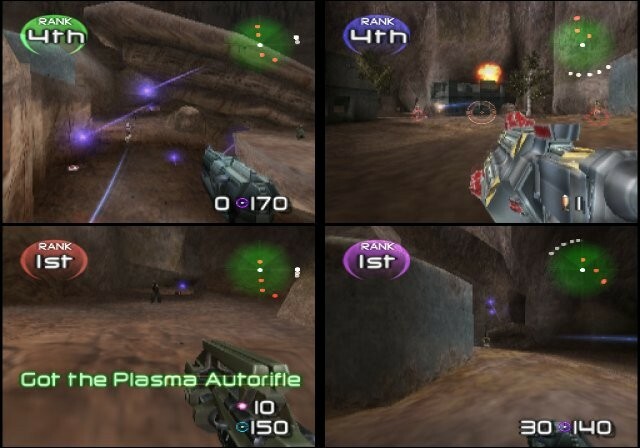 The reason for these memories was how similar the gun-toting action, fast and frenetic shooting fun, and myriad of multiplayer modes and options available to players. 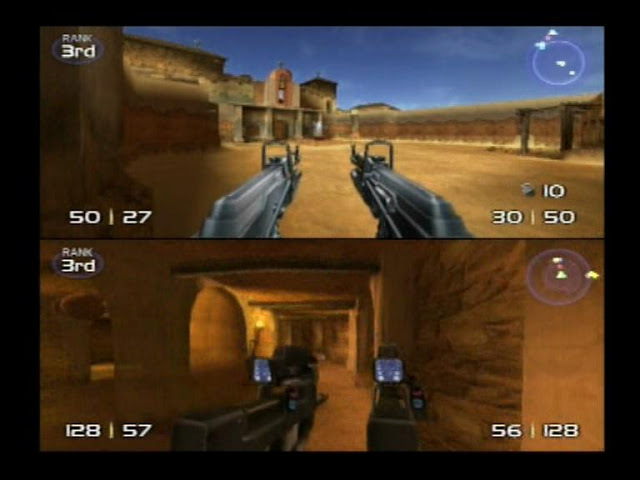 TimeSplitters 2 was a shooter that offered so much to sink players' teeth into, delivering engaging matches against both player and yes, AI bot, something that is still routinely missing in many a-shooter today. With the creative arsenal of weapons, well designed maps, and set of unlockables to keep the entertainment going for ages, TimeSplitters 2 calls back to a nostalgic and enjoyable era in first-person shooter history. 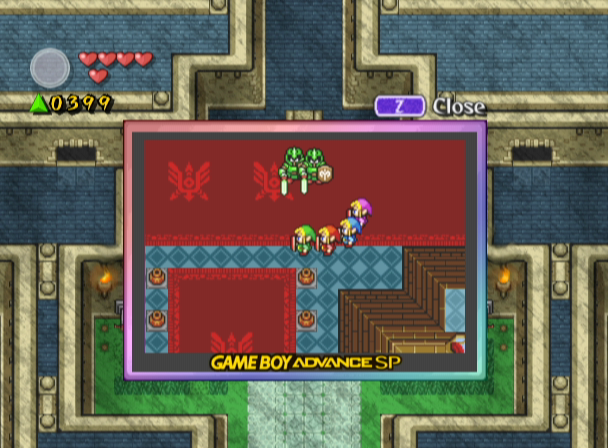 The other game on this list other than Final Fantasy Crystal Chronicles that utilized the link-up of Game Boy Advance systems to the GameCube for dual-screened gameplay, The Legend of Zelda: Four Swords Adventures, like Crystal Chronicles, could be completely played by one's lonesome. 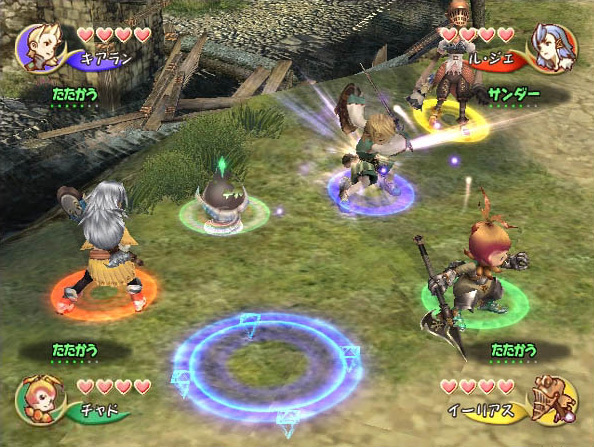 However, the real engagement of this game came from teaming up with up to three other Links, working as a unit to slay monsters and other enemies, solving puzzles of various difficulties, and bringing down sinister bosses. Yes, working together to defeat huge swarms of enemies and exploring expansive areas of Hyrule remains a fantastic feature of the multiplayer, making it so no one person on your team is more important than any other. 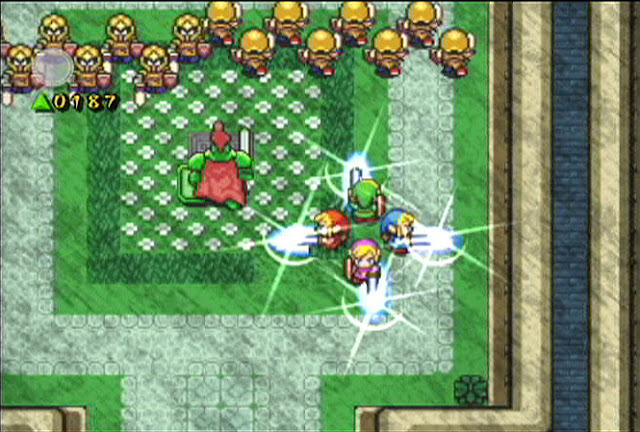 While not a traditional Zelda, Four Swords Adventures is still a fabulous take on Nintendo's 30-year-old franchise. 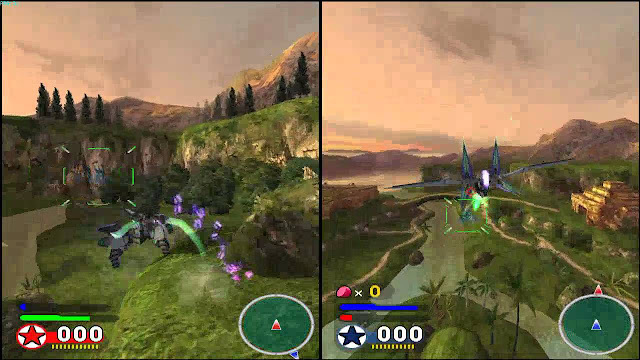 Though the opinion of the solo campaign of Star Fox Assault is mixed at best (I happened to enjoy it for what it was, despite feeling it was quite poor in comparison to Star Fox 64, but what isn't? ), it is still pretty commonplace to hear players of the game get excited about the multiplayer component. Featuring the ability to have shooting skirmishes across maps both compact and open with up to four players, Star Fox Assault's multiplayer reigned supreme and remains many fans' favorite multiplayer experience in the entire Star Fox franchise. Performing tactical stunts like switching between vehicles on the fly, riding on the wing of an Arwing while blasting rockets to the ground below, and hiding behind map geometry to avoid the shots from a Landmaster were all absolutely enjoyable things to do. One could spend dozens of hours in the multiplayer alone, making the short campaign not sting so much after all. 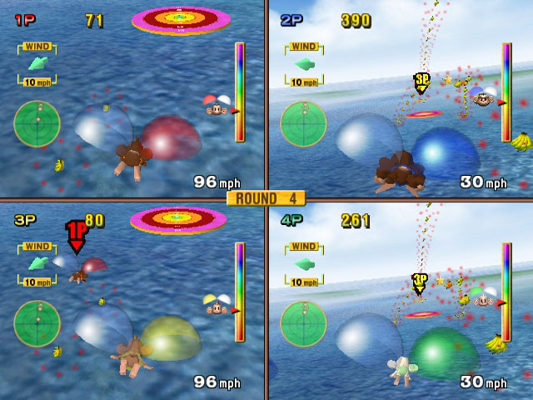 The sequel to one of the Nintendo GameCube's greatest launch titles (and there was no shortage of fantastic games at the system's launch), Super Monkey Ball 2 allowed for up to four players to take turns taking on the challenge of the main game's levels. However, any Monkey Ball multiplayer fan worth their weight in bananas knows that the real fun comes from the multiplayer games available. 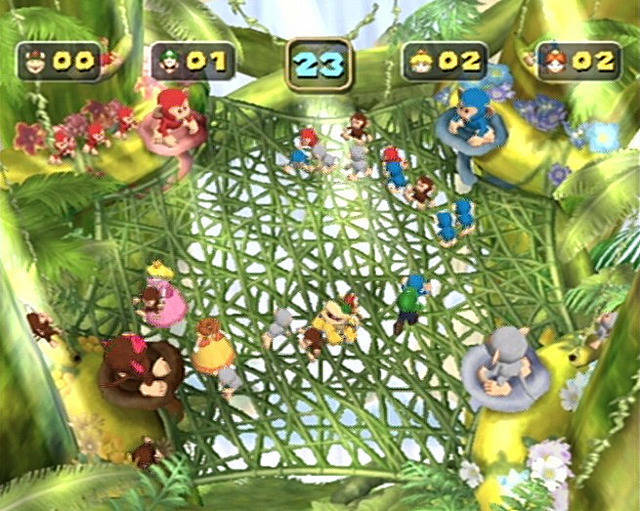 In addition to old standbys like Monkey Target (a favorite of the SuperPhillip Central household), Monkey Race, and Monkey Bowling, new additions to the multiplayer including Monkey Soccer and Monkey Tennis are included to add to the four player fun. 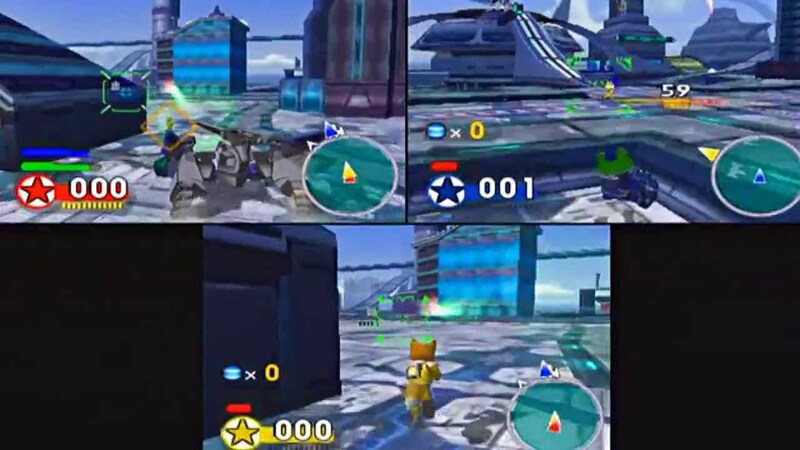 There was so much to monkey around with in Super Monkey Ball 2 that a player and his or her friends could lose entire nights easily to this game. 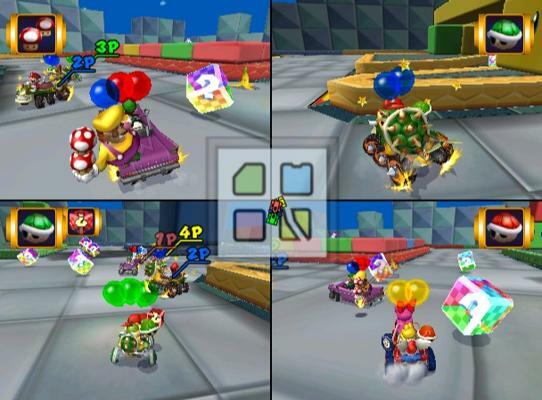 With four unique Mario Party games released on the Nintendo GameCube, the most for any of Nintendo's different hardware, it was a challenge to choose from the list as the game to represent on this top ten list. 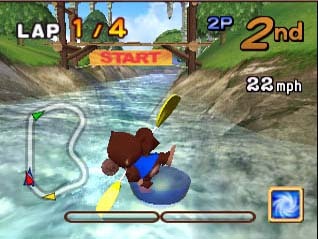 However, with an engaging number of creative and enjoyable mini-games, as well as a wonderful capsule system to use on the main boards to change up strategies and give the player a feeling that they're somewhat in charge of their own destiny, Mario Party 5 remains SuperPhillip Central's favorite Mario Party on the GameCube. 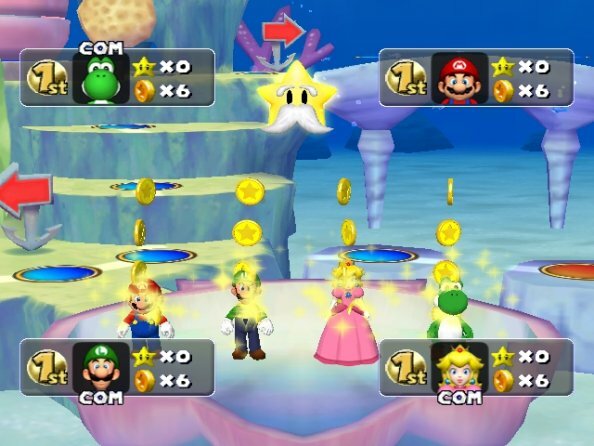 Whether you were playing a mini-game against all players or a teaming up, stealing coins or Power Stars from players, or coming up with unique strategies to try to win over your other similarly-conniving friends, Mario Party on the GameCube was no better than in Mario Party 5. You can't complain that Nintendo did the same-old, same-old with Mario Kart: Double Dash! !--this time including the ability for up to two players to ride in a single kart, being able to switch who drives and who rides on back on the fly. Sure, you could have four players driving four separate carts, but where was the fun in that? Otherwise, you could have it so two local players would have to use communication to decide when to switch, when to use items, and to initiate power slide boosts. 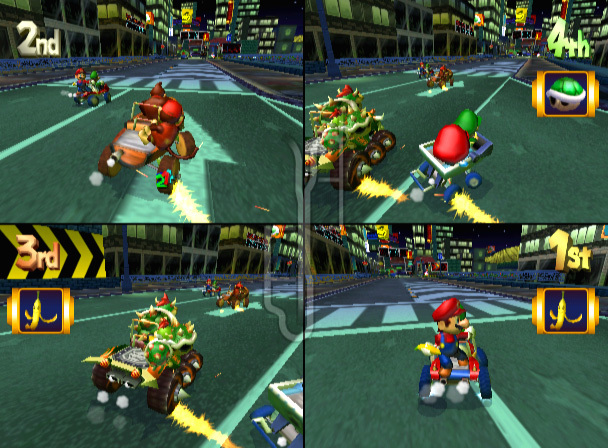 The rarity in a Nintendo GameCube game that was the addition of LAN support meant that the eight players could be scattered across four karts for maximum carnage. With 16 new tracks with the ability to play through them all in one cup, and a very competitive battle mode, Mario Kart: Double Dash!! delivered high speed thrills and chills. What can you say about a four player fighter that is still beloved and played in a tournaments to this very day? Well, how about-- DUH! Of course, it's number one on a multiplayer GameCube game list! With that out of the way, a robust lineup of characters that for the most part each have their own play style to fit the needs of any particular player made for a game that anyone could enjoy. 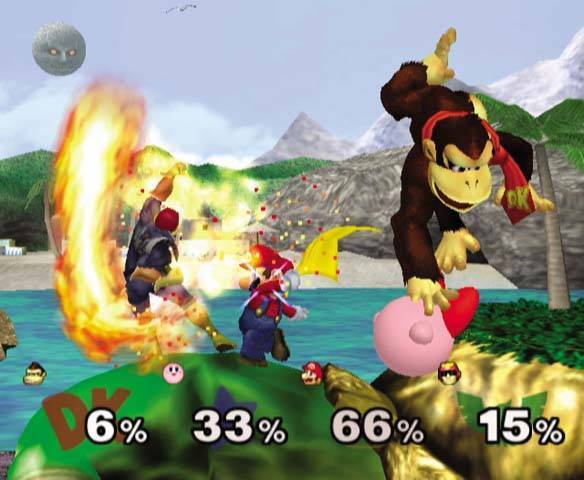 It wasn't just the 25 character roster, either-- no, the amount of modes and features packed on a small GameCube disc meant that your friends and family members would have so much to play through. Melee is a game that is infinitely rewarding and playable due to no two players fighting it out the same way. 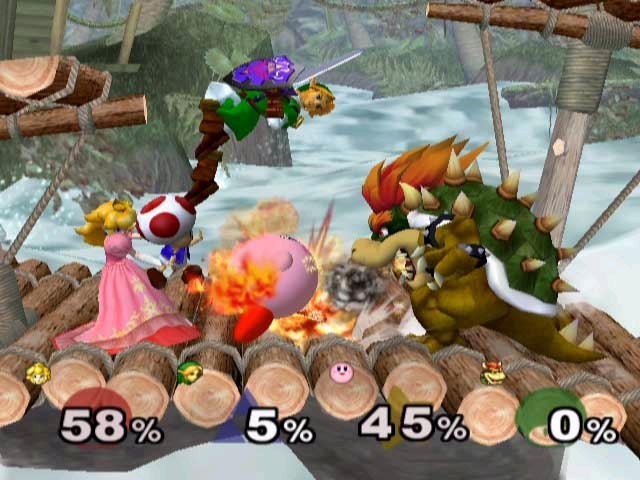 Super Smash Bros. Melee was the best-selling GameCube game for a reason, and it wasn't just for the reason that it was released early in the system's life. I enjoyed the very first Dragon Ball Xenoverse last year, but the RNG for gaining moves, items, and equipment hurt the game overall. It's yet to be seen if this issue I had with the original Xenoverse will hurt this sequel. It definitely looks the part of a Dragon Ball Z game, having the villains tinker with the history and events that fans of the series no doubt know quite well. Due out in 2017, the HD remastering of Final Fantasy XII is shaping up to be quite the treat for both role-playing game fans and those with a fondness for Final Fantasy. Check out the Tokyo Game Show 2016 trailer for Final Fantasy XII: The Zodiac Age below! The PlayStation press conference before the official opening of the Tokyo Game Show in Japan was overnight here in Central City. I was actually awake for it. One of the games that I was hoping to see again was the newest Minna no Golf (or Hot Shots Golf in the Americas, and Everybody's Golf in PAL territories). With new gameplay features such as fishing, coin collecting, golf cart driving, along with the traditional golf, this PlayStation 4 version of Hot Shots Golf looks like a combo between PlayStation Home and the Hot Shots brand. Here's hoping there's still more of a heavy focus on actual golf. Disappointingly, this game isn't due out for at least next summer.